Yesterday saw the first real big test for the Manchester United women's team when they came face to face with Arsenal in the Continental Cup semi final. Arsenal are flying high at the moment in the Women's Super League and are strong contenders for the top spot, they are also the current holders of the Continental Cup so obviously they wanted to try get back to back wins. Manchester United however, are newly reformed this season and are sitting 4th in the league with plenty of games in hand. They have played 11 games in the championship and having only drawn 1 game and lost 1 out of the 11 they are definitely contenders for promotion when the time comes. They have scored 52 goals in the league too whilst only conceding 4. To say they have only reformed they have been doing brilliantly but you can really tell the difference between them and the other championship teams as manager Casey Stoney has managed to bring with her some absolutely brilliant players such as Alex Greenwood, Martha Harris, Siobhan Chamberlain and Leah Galton. The quality difference in their league is one of the big reasons I couldn't wait to see how they faired up against Arsenal as this was definitely one of their biggest challenges yet. Arsenal may have been hit by a lot of injuries this season but their starting 11 didn't show that and they put out a very strong side including Beth Mead, Leah Williamson, Kim Little and of course high flying Dutch striker Miedema. To say they put out a strong side in the opening 10 minutes they did look really shaky, United were pressing really well and closing down the defence. However, it only took one great pass through to Miedema for Arsenal to go up 1-0. You would have thought this would knock United's confidence but honestly they kept on fighting even with Arsenal dominating possession providing themselves with some brilliant chances they unfortunately couldn't capitalise on. 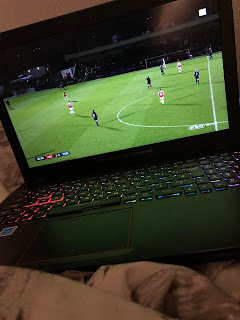 Arsenal went 2-0 up through another brilliant Miedema goal which Chamberlain had no chance of stopping and it was a well deserved goal as Arsenal had really picked up and got settled into the game. But that second goal seemed to spark something in United and after a couple of changes, they had Arsenal playing out from the back under a lot of pressure again. Kirsty Hanson cam on and really made a difference for United with her strength and speed, I honestly don't think Arsenal knew what to expect from the player and she really worked that to her advantage. In the 83rd minute of the game a brilliant strike from Mollie Green made the game 2-1 and that really put the pressure on the hosts as United kept the pace going and trying to get that equalizer. Unfortunately it wasn't to be and the game ended at 2-1 with Arsenal progressing to the final where they will once again meet Manchester City. Although it ended in a defeat for United they can be proud of how they played as their are Super League teams who have let more in from Arsenal and United showed the fight needed to keep it a tight score line. I think a lot of people wrote United off before the game even kicked off but I am so glad they proved everyone wrong. I just wish we could have had that first Manchester derby as the final but I guess there is still the FA cup to provide the first meeting if the draw ends up going that way. Manchester United are proving to be a great team to keep up to date with and it is made easier seen as Liam seems to have switched from Man City to United which leads to some interesting conversations in our house these days. I think the team has really begun to prove others wrong and is really starting to build up a strong fanbase and I can see them becoming a huge threat in the future. As for Arsenal, for a team to do so well with some many injuries they really are a force to be reckoned with and if they carry on the way they are I think the Super League is going to go to the final day, which makes it even better for us as fans. Player of the match went to Kim Little and it was well deserved for her as she was there for every big play created by Arsenal, Kim is one of the players who doesn't get enough credit for how good she really is. Next up is the final held at Sheffield United's Bramall Lane, between Manchester City & Arsenal on Saturday 23rd February kick off is 12:15pm.